San Francisco, April 16, 2007 - The Henry Wilson Coil Library & Museum of Freemasonry is hosting an exhibit of anti-Masonic items from around the world at the Nob Hill Masonic Center (1111 California Street). The show, entitled “Sacking the Temple,” is open Mondays from 10-3, Wednesdays from 10-5, and Thursdays from noon to 8 pm until October 1. Exhibit visits are also available by appointment. "It may seem unusual to have this kind of art on display at the Grand Lodge, but Anti-Masonry is really an integral part of our history," says exhibit curator Adam Kendall. "Whether we like it or not, there has always been strong opposition to Freemasonry and we shouldn't be afraid to confront it." 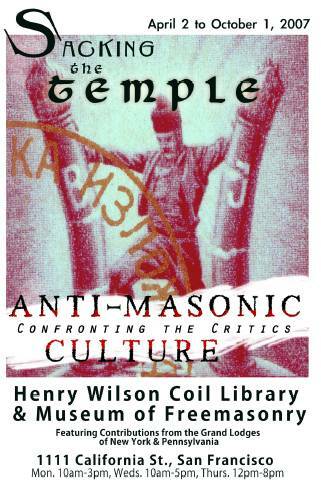 The exhibit includes American and European rare books, photographs and other artifacts that feature anti-Masonic writing and art, religious tracts which highlight purported ties between Masonry and devil worship, and several official documents produced by totalitarian governments in the 1930s and 40s, including anti-Masonic stamps from Serbia and posters from Nazi Germany.